We’re in debt to Mr. Townsend for helping us tease out the petrodollar’s endgame here. Erik parlayed the fortune from his first career as a software entrepreneur into a second career as a hedge fund manager who knows the oil futures market inside out. Think about it, he says: Where’s the incentive to keep pricing oil in dollars and maintaining large dollar reserves if the U.S. is no longer your biggest customer? 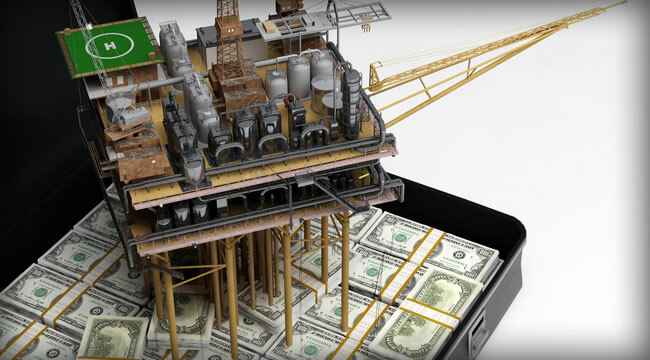 As it is, the Arab oil sheiks have more dollars than they know what to do with. 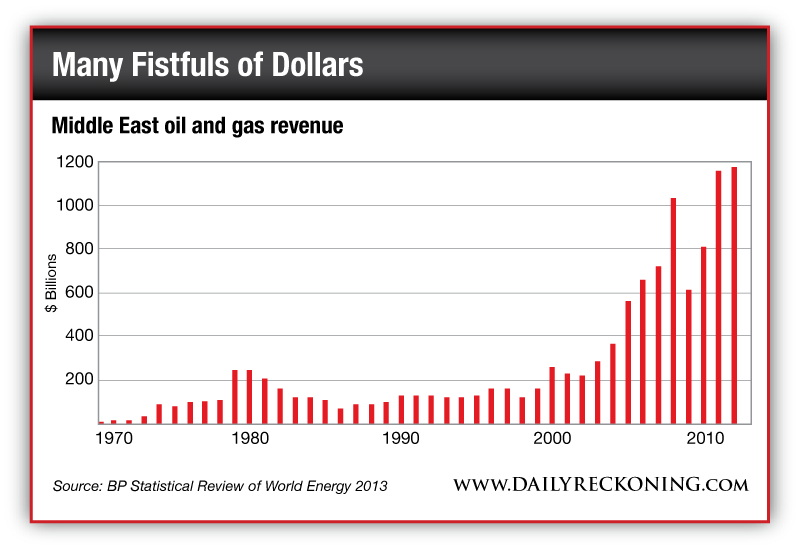 In the three decades before 2000, total energy export revenue from the Middle East totaled $3.5 trillion. In the 13 years since, the total has swelled to more than $8 trillion. By one expert estimate, some $8–10 trillion in currency balances lie in Middle Eastern hands, much of it in dollars. How long will they want to keep all those dollars lying around? Especially when Asia and the Pacific now account for one-third of global oil consumption and the U.S. only 20%? Meanwhile, the world’s leading oil importer — China took that crown from the United States last fall — is doing its part to undermine the petrodollar. In recent years, China has been striking agreements with many of its trade partners to do business using each other’s currencies. China and Russia, China and Brazil, China and Australia, even China and its old/new enemy Japan — they all have currency swaps and other arrangements in place to bypass the dollar. Last November brought word the Shanghai Futures Exchange was thinking about pricing its new crude oil futures contract in both yuan and dollars, with the aim of making that contract the new Asian benchmark. “The yuan has become more international and more recognized by the financial market,” the head of a Chinese trading firm told Reuters. But while the Arabs fret about the value of their dollars… and the Chinese move actively to diversify away from the dollar… it might be the Russians who deliver the final blow. “Tuesday, March 4, to me, was as big as the Cuban missile crisis in the history of the world,” says Erik Townsend, with an eerie portent of future events. On the surface, the worst of the crisis between Ukraine and Russia appeared to be over. Markets were calming down as Russia’s President Putin spoke up on the issue for the first time — pledging he would use force in Ukraine only as a “last resort” if the Russian-speaking population was in danger. Two other speeches by lesser Russian officials got much less attention. Kremlin economic aide Sergei Glazyev said if faced with Western sanctions, Russia could figure out how to avoid using the dollar for international transactions. “We would find a way not just to reduce our dependency on the United States to zero but to emerge from those sanctions with great benefits for ourselves. Yes, he’s only a spokesman… but he speaks on behalf of Russia’s wily foreign minister Sergei Lavrov. And as we go to press, he still has his job. “I wouldn’t be surprised if somebody in China heard him say that and maybe his phone is ringing. Understand that’s a possibility, not a forecast. But almost no one noticed. From the Russians’ standpoint, 18 months might be a little optimistic. “I doubt that a U.S. bond and currency crisis is going to happen on Obama’s watch,” says Erik Townsend. “He’s only got a couple more years; we’re getting close. But to go eight more years — assuming the next president gets two terms — to go from 2016 all the way to 2024 without the U.S. bond market blowing up for one reason or another, I can’t see it. Lost jobs, lost homes, lost hope… and then what? That’s when U.S. leaders sit down with their “partners” from Europe and elsewhere and tell them China and Russia are about to become the biggest and baddest world powers — unless the West joins forces for a new global reserve currency. “We’re going to merge the dollar and the euro and whoever else we can get onboard to do that. That is, there will be one conversion rate between the dollar and the new currency for the elites… and another for everyone else. And to think it all began with the newfound American prosperity brought about by abundant made-in-America energy. When does Judgment Day arrive? When might the Saudis or the Russians or the Chinese — or any or all of them in cahoots — pull the plug on the petrodollar? Mr. Townsend says not on Obama’s watch. That seems believable. 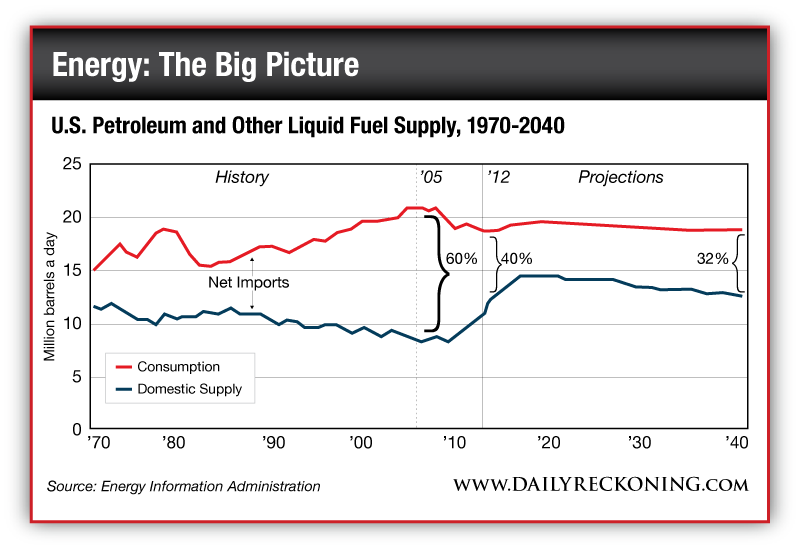 Perhaps the most logical time is when America reaches the point of minimum reliance on foreign oil supply — the moment when petrodollars will be least necessary to grease the wheels of international commerce. That’s when the sheiks and the oligarchs and the Central Committee can make their escape. We’ve gone from importing 60% of our oil needs in 2005 to only 40% now. Within another five years, the amount will shrink further to only 30%. This “30% threshold” might well be your cue that the crisis is nigh. No guarantees, of course… but it’s not hard to believe someone in Riyadh or Moscow or Beijing is watching this very data as the U.S. Energy Information Administration posts it online every month. P.S. We don’t blame you if you’re skeptical. It’s a lot to take in. But it’s important to consider this scenario… and foolish to ignore it as a possibility. That’s why you should take steps now, today, to protect and grow your wealth no matter what. And in today’s issue of The Daily Reckoning email edition, we gave readers a chance to do just that – including one opportunity that shows them how to turn $500 into a 7-figure fortune in as little as two months. These kinds of wealth building opportunities are packed into every single issue of The Daily Reckoning – which gets delivered straight to subscribers’ inboxes every afternoon. Don’t miss the next issue, or any of the great potential profit opportunities that come with it. Sign up for FREE, right here, start getting the full story.